In this best-selling video, Dr. Yang, Jwing-Ming instructs and demonstrates "the Eight Pieces of Brocade", one of the most popular sets of Chinese healing exercises. These gentle breathing, stretching and strengthening movements activate the Qi energy and blood circulation in your body, helping to stimulate your immune system, strengthen your internal organs, and give you abundant energy. With both a sitting and standing set, anyone can practice these simple and effective exercises in as little as 15 -20 minutes a day. Ken Cohen, M.A. 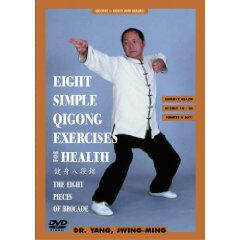 is a renowned China scholar and qigong master and is the author of the internationally acclaimed book The Way of Qigong. Qi Healing will teach you to use authentic techniques yourself to heal and energize others.